The emphasis at Pasta Bowl is on excellent but inexpensive food served by friendly and efficient staff in relaxed surroundings. Call in and select from the superb range of pizzas, pastas and traditional Italian dishes – two courses from the lunch and early evening menu is only £6.95 – complemented by a carefully chosen wine list of regional Italian and New World wines. 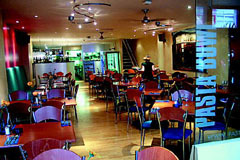 Perfect for both family and business dining and an ideal location for a party. Open every day noon-11pm. All major credit cards accepted. 10% optional service charge. A superb range of Anti Pasti, meat and chicken main courses, fresh pasta, stone oven baked pizzas, low fat options and a good vegetarian selection.